Ed Miliband has a point. When this country toppled into crisis in 2007-08, it was widely feared that the financial collapse would lead to mass unemployment on a scale that dwarfed the recession of the early 1980s. And it hasn’t happened, or not quite. Yes, unemployment is really bad. Yes, the statistics are manipulated. And yes, the absence of attractive jobs will scar an entire generation. But those features of the 1980s recession – entire industries disappearing, whole towns out of work – haven’t recurred. What has happened, however, is a catastrophic loss of output, capital expenditures and savings far worse than in any post-war recession. In fact some would argue that this is a full-blown economic depression (I’m among their number). Since something has to give, average earnings are, in real terms, now at the levels they were a decade ago. Since taxation is now generally higher, as are pension contributions in the public sector, that statistic actually under-represents the injury to living standards. If we throw in the number of people working part-time, when they would prefer to be working full-time, or self-employed out of necessity rather than choice, you are looking at an economic disaster on an unprecedented scale. Miliband likes to draw attention to these problems by flourishing a statistic of his own: that in 38 out of 39 months under the Coalition Government, real wages have fallen. He’s cleverly made that fact the central plank of his quest for election in 2015. I think he’s right to do so. Real wages are determined in part by such things as productivity, exports, investment, and the general health of the British economy. Since British firms do badly in these respects, and since the export climate is dour, there’s not much help to be expected from the “real economy”. But that’s only half of it. The other half is monetary policy, which has been kept absurdly slack from the very start of the crisis – and indeed years earlier too. The Bank of England has consistently overshot its inflation targets and responds by pumping yet more invented money into the hands of a disbelieving banking sector. Too much money chasing too few goods can have only one result. Fuel prices up. Transport prices up. Food prices up. Water up. Housing up. If you’re a student, then the cost of education has screamed upwards. Oh, and if you think that booze or fags would be there to console you in your poverty, then alas those comforts have gone up in price more than almost anything. These things haven’t simply escalated in price, they’ve gone up by more than “average inflation”. And, as you may have noticed, you can’t easily get by without food, water, fuel or housing. Miliband’s solution comes straight from the Old Labour playbook. Squeeze the rich. Price controls. Blame big business. Tunes last popular when flares were big and the Bee Gees were at the height of their careers. Trust me. Real Change, really Ed? And the tunes are stupid. Take Miliband’s Big Idea: a price freeze on energy companies. This is a policy so bad, it’s actually hard to count the errors. But here are a few. One, energy companies don’t actually make excess profits. SSE, for example, earns a net margin of just 1.7 per cent. The Economist estimates that across Europe power companies have lost more value than the entire banking sector. This is emphatically not an industry that’s growing rich on the back of consumers. Two, Britain faces a coming power crunch, the result of recent under-investment. If you want more private power generating capacity, you have to let the private sector earn a return on its investment. Miliband’s scheme threatens that. Three, it doesn’t just threaten it for the 20 months of a price freeze. By creating an uncertain regulatory climate, the deterrent starts now and doesn’t end until Miliband retracts the policy in full. Four, focusing on power ignores all those other things that form part of the problem. Five, by focusing on big companies, Miliband ignores the truth, which is that quantitative easing and terrible government planning form the real heart of the problem. So although Labour has identified the right problem, its “solution” is terrible. But there is a Big Idea available here, and any party could seize upon it. What we need is for the Office for National Statistics to draw up an Essential Goods Index, which would be just like the regular retail price index, except that its basket of goods should reflect purchases only by those on average incomes or below. Because the index would reflect all the basic goods that ordinary families depend on such as housing costs, bread, chicken and the cost of energy, politicians couldn’t game the system. As policies go, it’s brilliant. It’s virtually costless. It’s honest. It focuses attention on the true victims of this recession. Such an index wouldn’t be hard to construct – they’re my personal sphere of expertise (in 2001 I created the LEBA Power index, which remains the industry benchmark because it is incapable of being manipulated). 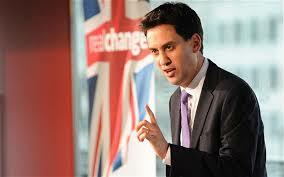 If Miliband would like to pick my brains on creating an Essential Goods Index, I’d be happy to help. Best of all, the only way for politicians to respond to the new index would be with policies that actually worked. Abolishing the insanity of quantitive easing, which only serves to inflate asset bubbles and prices. Encouraging housing supply without encouraging unsustainable demand. Increasing power generating capacity in affordable ways. Improving public transport without huge vanity projects (HS2, I’m looking at you). An Essential Goods Index is so clearly necessary it’s bewildering it doesn’t already exist … except that politicians are no doubt nervous of the truths it would make plain. QE doesn’t work. Inflating property bubbles is stupid. Fostering a banking industry whose giants are still too big to fail and which continue to lend too little to British business is even stupider. Solve those problems, Ed Miliband, and you’ve got my vote. I agree with a lot you say. Surely we need a CPI that reflects reality. Not sure I agree with the energy companies only making a ‘small’ profit. Often, with these companies , the ‘underlying’ activity (gas, electric) is only a small part of their activity, that is, they have large investment arms that move money around very fast supplying a large ‘rentier’ element to their activities. I received a letter from SSE saying they only made £2 a week out of dual energy supply, however, they are treating the public like mugs if they expect us to believe there are not substantial sources of money coming from their investment arm. QE needs to stop, of course. Apparently, the banks are contributing more to the economy through the fines they pay out such as PPI, CPP and now the interest rate swap scandal. Strange banking system that only ‘helps’ the economy through the fines it pays! Banks are not paying tax on “settlements” and whats worse is proceeds from the illegal profits banks made outweigh economic benefit. Nothing has changed – credit and debt structures are bigger and more leveraged than when the crisis began. It is stunning to think that such a thing as an Essential Goods Index does not already exist. Given your expertise and access to raw historical data Mitch, can you not construct an Essential Goods Index over the last several years and show that it has the utility we suspect? I would be very interested to see this.